CD review: "The Hillside EP"
This review first appeared in Turbula in May 2009. 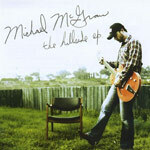 San Diego's Michael McGraw has a new CD out that recalls the folk-rock crossover acts of the late 1960s through early 1980s, artists like Cat Stevens, Al Stewart or even fellow San Diegan Stephen Bishop. The structure of his songs is drawn mostly from folk music, but the full band and electric instruments give it a rock feel  as do the complex, layered arrangements. McGraw's tenor singing voice bears a slight resemblance to Stevens', and if he hasn't yet written any songs on a par with the classics tunes that came from Stevens' pen, the first two songs on this EP are hypnotic little pop-rock gems. "Carousel" has as lovely a melody as you'll ever hear and nice wordplay on the lyrics. The opening track, "Alittle Better Uniform," is equally hook-laden, and would have fit comfortably in nearly any week's American Top 40 from the 1970s. The other four songs aren't quite as memorable, but on the strength of those first two songs, this is a release that makes McGraw a songwriter and performer to pay attention to.